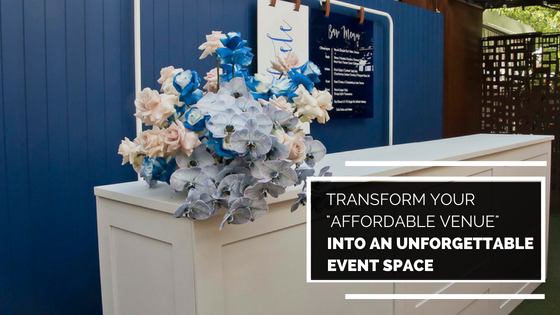 For example, there are a number of tricks and secrets of the trade that can turn even the “affordable venue” into a world-class event space. Today we are highlighting three of the best of them. When it comes to making your four walls and a ceiling look like a glamour scene from a Hollywood blockbuster, it’s important to follow the old adage of ‘hide the negatives and emphasise the positives’. Setting up draping and backdrops to cover walls, brighten up your space and add an extra dimension is a great way to spruce up your venue and ensure it stands out in the memory of all your guests. By making full use of the best possible AV equipment in your venue, you can help bring light to any dark spaces and keep your guests focus on the positive aspects of your facility. If you’re looking to push the boundaries, including little touches like moving gala event lights or 3D projections can really help bring out the best in your facility. Remember that guests will often forgive a somewhat unsightly venue if treated to a truly enjoyable event experience. If your budget or other such limitations mean that you simply can’t offer the best possible facilities, then you must ensure that the presentations or performances on offer are world class. To this end, make sure that your audio systems are of high quality, as people will often be happy to ignore a slightly rundown venue as long as there is good music and company to enjoy! If you are looking to get the best ROI from your event budget, get in touch with Pro Light & Sound. With over 25 years of experience working in the AV and event styling scene, we are sure to make your next event your best one yet!